Rosé still wines, particularly those from Provence, France, receive considerable press this time of year since this seasonal varietal is traditionally released in the spring. The United States is second only to France in rosé wine consumption, with women consuming more rosé than men. There are reports touting the rise in popularity of “brosé” among men, but the pink varietal still retains an emasculating connotation to many men. 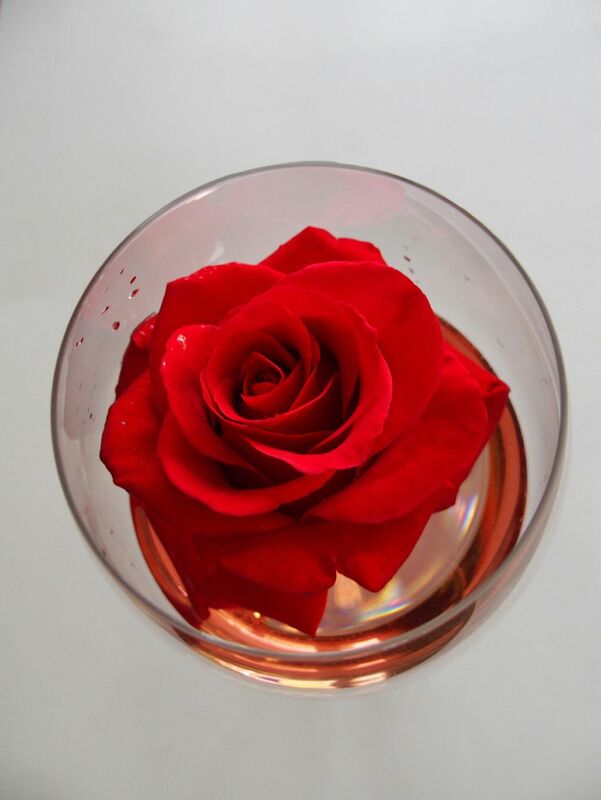 Rosé wines have a history of introducing neophytes to wine over the last fifty years. Slightly sweet Mateus and Lancers rosés were a favored quaff of young people of my baby boomer generation, and more recently, white Zinfandel, a high-volume wine produced in California, has filled the role. These sweet rosés appeal to the American soda pop palate, but can lead to interest in dry versions which have become increasingly de rigueur. Domestic Pinot Noir rosé wines make up a very small percentage of the market, but their limited production is one factor driving their popularity, along with an attractive price point (usually $18-$25). Pinot Noir specialists frequently offer small quantities of rosé each year, often bleeding off some juice (saignée), concentrating the color and flavor compounds from the skins in the remaining juice to enhance the quality of red Pinot Noir. 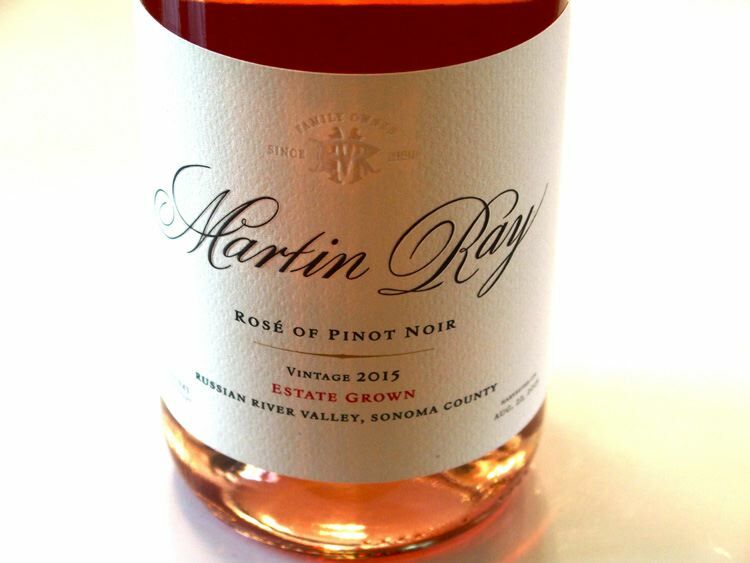 Pinot Noir rosé is rarely profitable at it’s lower price point, and therefore few producers farm vines specifically for rosé and vinify it in a serious manner befitting regular Pinot Noir. 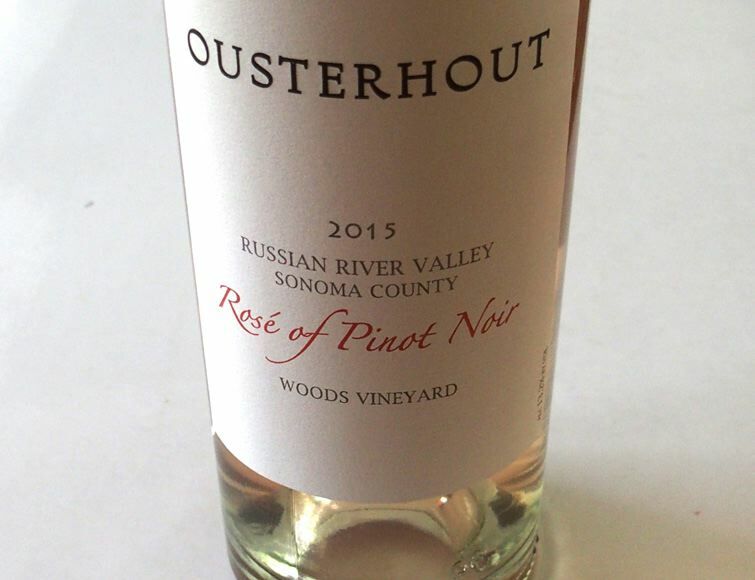 Exceptions can be found, and a number of serious Pinot Noir rosés are offered in both Oregon (examples are rosés offered by Antica Terra, Stoller Family Estate, and Van Duzer) and California (Heintz, Ousterhout and Red Car). Although the best examples of domestic Pinot Noir rosé are rarely epiphanic, they should not be judged by their color, and can offer a “real” and exceptional drinking experience in the right context. For me, the biggest advantage of Pinot Noir rosé over red Pinot Noir is that rosé is best chilled and therefore ideally suited for steamy summer days when grazing and dining outdoors is best enjoyed with a lighter, colder wine companion offering lower alcohol and higher acidity. The only thing better on a hot day than a well-crafted and chilled glass of rosé is another glass of rosé. Rosés are best enjoyed when fresh, that is, consumed within a year or two of the vintage date. Vintage can make a difference with Pinot Noir rosés just as with red Pinot Noir, and the current offerings are from the excellent 2014 and 2015 vintages. 2015 was another warm vintage but nearly ideal growing season for Oregon, like 2014, with the resulting harvest generous due to great fruit set, making Pinot Noir rosé readily available. 2015 was also an outstanding vintage for California, and one of the earliest harvests on record (Richard Sanford, owner of Alma Rosa Winery & Vineyards said it was the earliest harvest in his 46 years as a winegrower). Yields were down, following three larges harvests in 2012, 2013 and 2014, but the quality was superior. California Pinot Noir rosé production should be noticeably less prolific from the 2015 vintage. 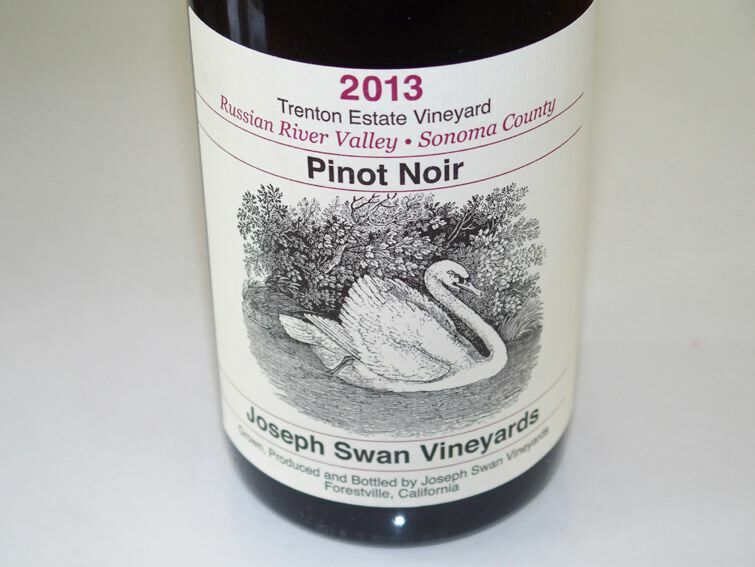 I have reviewed here several recently released serious domestic Pinot Noir rosés. The scores are not comparable to those of red Pinot Noir, but are uniquely gauged for rosé Pinot Noir. Chardonnay is by far the most popular varietal among American wine consumers, representing about 21 percent of table wine volume in United States food stores in 2014, according to estimates of Gomberg- Fredrikson & Associates. The 2015 Sonoma State Wine Business Institute report on American wine consumer preferences found that when a sampling of subjects in the age group of 21 to 68 years were asked to pick their favorite grapes from a list, 50% included Chardonnay, the most of any variety. Chardonnay is California’s most widely planted winegrape with 97,826 acres reported in 2014 leading to a total harvest of 718,029 tons. The USDA National Agricultural Statistics Service reported that Chardonnay accounted for 16.4% of all grape varieties crushed in California in 2015, with Cabernet Sauvignon second at a distant 11.8%. Monterey County has the most California Chardonnay grape acreage, followed by Sonoma County and then the San Joaquin Valley. Oregon is a very small player in Chardonnay production compared to California, harvesting only 3,972 tons in 2014. However, recent years have shown a renewed interest and commitment by Oregon vintners to producing Chardonnay and the quality of the wines have escalated. The current crop of Oregon Chardonnays represent the third iteration. 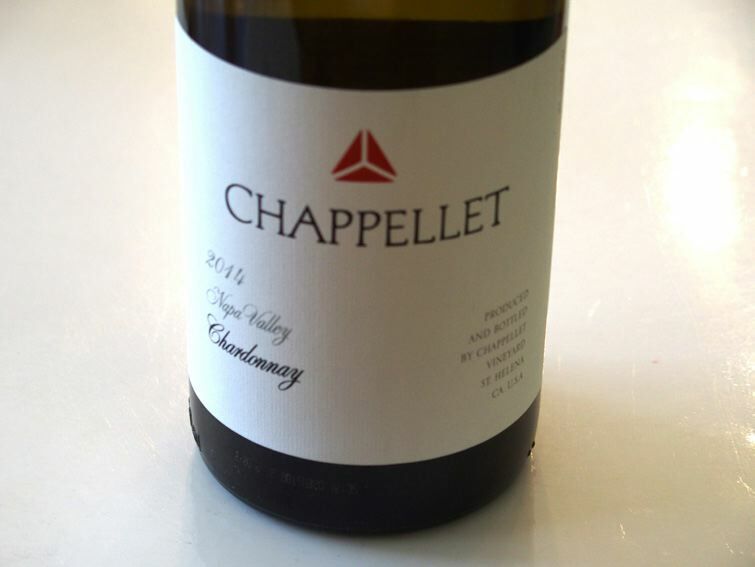 The earliest Chardonnays of David Lett and others were superb, but it was quickly learned that the clones planted, such as the Wente clone, would not ripen properly in Oregon’s climate. This was at the time in the 1970s when Americans were relishing bold, buttery Chardonnays from California. The second iteration resulted from Chardonnay plantings in sunnier climes with hopes that the grapes would ripen. The grapes did ripen, but acid levels in the wines were wanting. The third and current wave of Oregon Chardonnay has been most successful because of viticultural knowhow and the importation and wide plantings of Dijon clones of Chardonnay. Chardonnay was planted in California back as far as the late 1800s. In 1882, Charles Wetmore, the President of the California State Viticultural Commission and owner of Cresta Blanca Winery, brought back budwood cuttings from Meursault in Burgundy. The budwood was then established in vineyards in the Livermore Valley. In 1912, Ernest Wente went to France and took cuttings from the University of Montpellier viticultural nursery. These cuttings took a prominent place in the Wente Vineyards in Livermore that had been established originally in 1883 by C.H. Wente, along with cuttings taken from the Gier Vineyard that had used some of Wetmore’s budwood. Most Chardonnay vineyards were uprooted during Prohibition, but small plantings of the Wente Chardonnay survived Prohibition. Ernest and Herman Wente took over the family business after Prohibition, and developed the Wente Chardonnay clones that completely transformed California’s Chardonnay wine landscape. In 1948, Fred and Elanor McCrea obtained budwood from Wente Vineyards for planting at their Stony Hill Vineyard in Napa. Louis Martini subsequently took budwood from Stony Hill and referred to it as “Wente,” a term that quickly caught on by other winegrowers who took budwood from the Wente Vineyards. Budwood from some of Martini’s vines, as well as Wente plantings in Livermore and the nursery established in Arroyo Seco by Karl Wente, were taken to the Foundation Block at University of California at Davis by Howard Olmo beginning in 1955. Olmo selected material that appeared to be disease-free and offered good yields. At the Foundation Block, the vines were grafted, tested and certified as Foundation Plant Materials Service (F.P.M.S.) clone 4. This clone is referred to as the “Wente” or “Heat-treated Wente.” Non-certified budwood, like that taken by the McCreas, is referred to as “Old Wente. The Wente family will be honored at this year’s International Chardonnay Symposium May 12-14, 2016, held in Pismo Beach, California. This year the Wente family celebrates the 80th anniversary of bottling the nation’s first varietally-labelled Chardonnay, a 1936 vintage. The Chardonnay Symposium will present a panel discussion titled, “Wente Clone Comparative Tasting.” For more information, visit www.TheChardonnaySymposium.com. 34 different clonal varieties of Chardonnay have been identified in France and these so-called “Dijon clones” have been exported all over the world. The most common Chardonnay Dijon clones planted are 96 and 95, both traced to Meursault, France, and 76, traced to the Saone et Loire region of France. Dijon clones have gain desirability in Oregon because they give better yields than the Wente clone, and they ripen earlier. The first Dijon clones of Chardonnay established in the Willamette Valley were planted at Knudsen Vineyard in the Dundee Hills in 1990 (clones 76 and 96, with clone 95 added in 1995). There are very few acres of Old Wente plantings remaining in the Northern Willamette Valley as most of the Wente vines have been displaced by Dijon clones. Some Oregon vintners, including Jay Christopher and Josh Bergstrom still profess a love for the Wente clone. Oregon has its own International Chardonnay Celebration, already held this year in Newberg in March. Visit www.ipnc.org/oregon-chardonnay/. 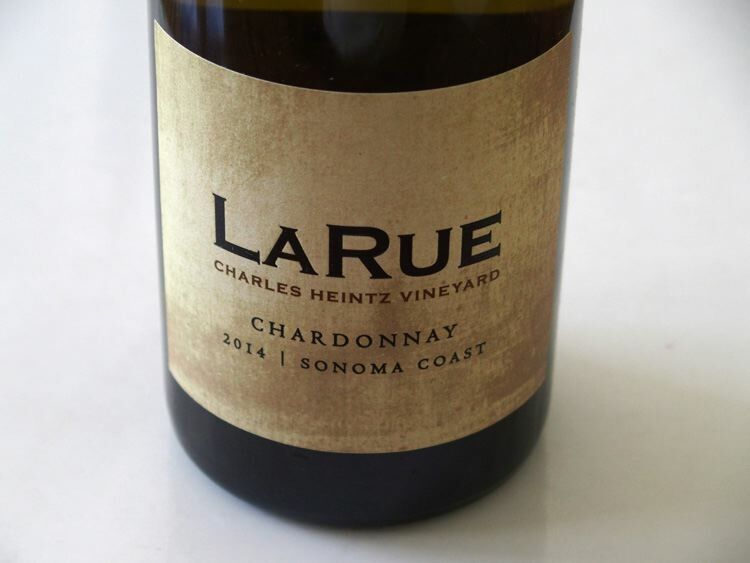 The most popular style of domestic Chardonnay is whole cluster pressed and barrel fermented with malolactic fermentation occurring in barrel, and aged sur lie with battonage. The combination of malolactic fermentation and new French oak barrels leads to richer wines with a noticeably creamy texture. There are many variations of this theme and winemaker decisions and manipulations generally play a larger role in Chardonnay than Pinot Noir. 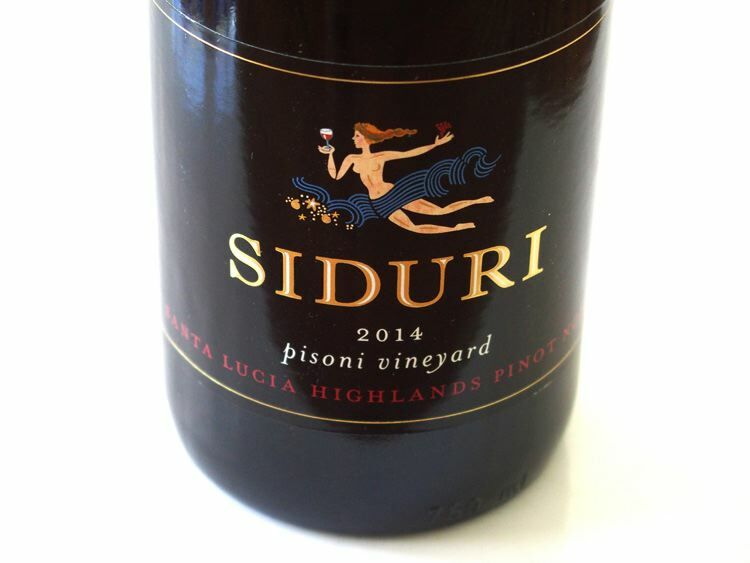 Why review Chardonnay in the PinotFile? Many wineries that craft Pinot Noir also produce Chardonnay and the two are natural partners. There is also a familial connection, as Pinot Noir is one of the parents of Chardonnay. Finally, Chardonnay is my favorite white varietal, and I am enthusiastic about sampling the diversity of offerings. Big Table Farm produced almost 700 cases of Chardonnay and 2,000 cases of Pinot Noir in the 2014 vintage. For the first time, some of the best barrels were pulled out, blended and bottled, without dramatically affecting the regular bottlings. 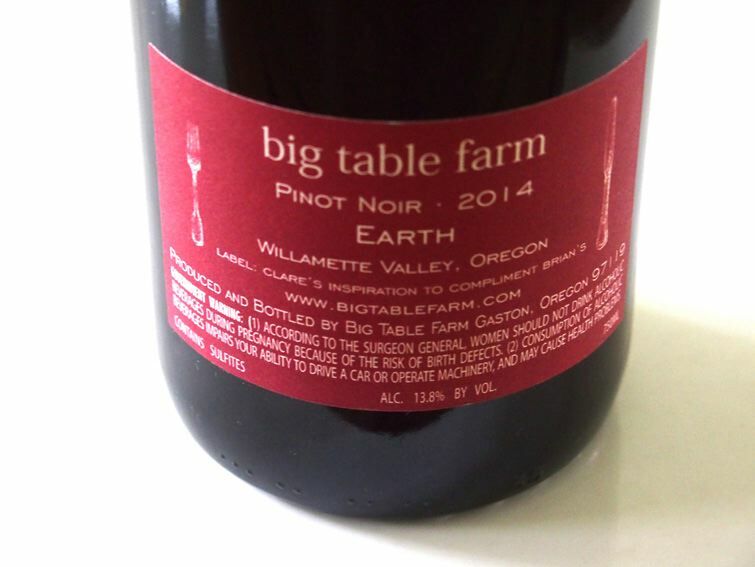 The Earth Pinot Noir and Elusive Queen Chardonnay are the result with only a little over 100 cases of each available. These wines are a departure from past bottlings. Winemaker Brian Marcy studied at University of California at Davis and has worked in several esteemed wineries including Turley Wine Cellars, Neyers Vineyards, Blankiet Estate and Marcassin. He is a fan of whole cluster ferments and the wines reflect this. Clare Carver manages the 70-acre farm and designs the unique wine labels which allows her to express her artistic talent. Visit www.bigtablefarm.com. Tasting by appointment only. Founded by Bill and Mary Byington, Byington Vineyard & Winery was originally a 95-acre mountainous retreat for the family acquired in 1958. Vineyard plantings came later. 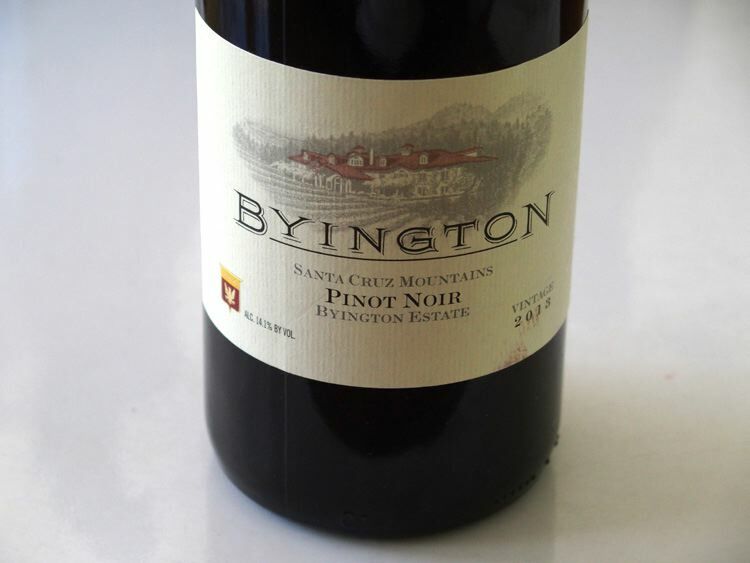 Byington was bought by Los Altos Vineyards in 2013 and the new owners have invested significantly in the property’s vineyards, wine production, facilities and grounds.The Byington Estate Vineyard is located at 2,100 feet elevation. Los Altos Vineyards also owns a 240- acre ranch in Alexander Valley with 36 acres planted to various varieties including Chardonnay (see review of Chardonnay in this issue). Visitors are welcome to the winery’s 18,000-square-foot villa that houses the winemaking facilities, wine cave, tasting room and event facilities. Visit www.byington.com. Founded by Cliff Lede in 2002, Lede Family Wines encompasses Cliff Lede Vineyards in the Stags Leap District of Napa Valley, and FEL Wines featuring appellation and single vineyard Pinot Noir and Chardonnay from the Anderson Valley and Sonoma Coast. 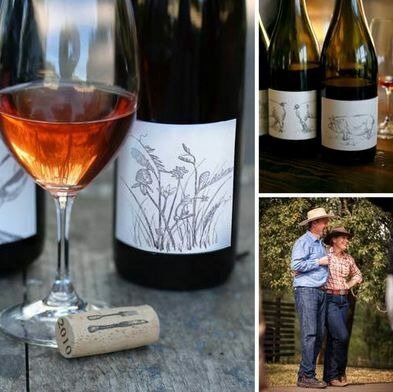 Winemaker Ryan Hodgins has over a decade of experience creating wines from the Anderson Valley. FEL Anderson Valley Chardonnay is reviewed elsewhere in this issue. 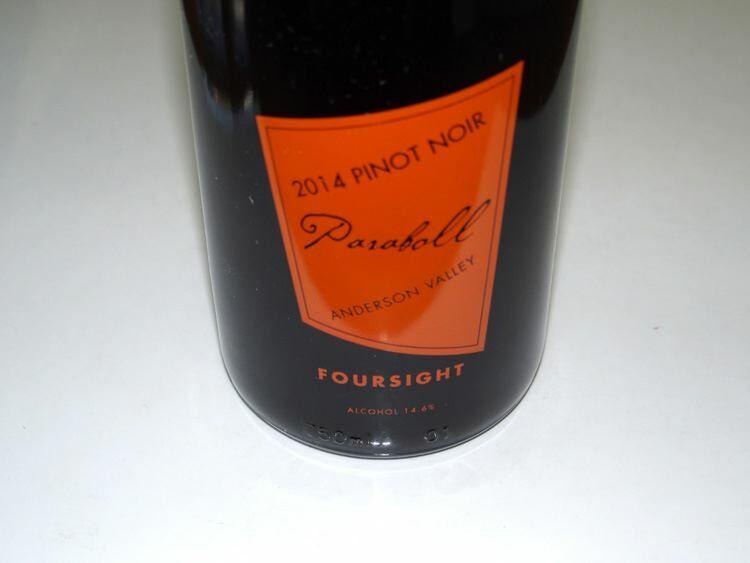 As described on the back label of Foursight Pinot Noir wines, the ingredients are grapes, tartaric acid and sulfur dioxide and the wines are suitable for vegetarians and vegans. Proprietary yeast has never been inoculated at the Foursight winery. All the wines tasted were rechecked the following day from a previously opened and re-corked bottle and were still stellar indicating some promising longevity. Visit www.foursightwines.com. Pictured is Foursight family clockwise from bottom left - Kristy Charles, Nancy Charles, Bill Charles and Joe Webb (photo credit John Clayton). The 2013 vintage was rather unremarkable in the Fort Ross-Seaview AVA. Bud break occurred in all blocks by March 20, flowering followed on May 11. In mid June, some vines showed water stress due to lack of rain and this was addressed with irrigation. 2.5 inches of rain intervened on June 23-26, leading to an increase in size of the berries, and this, along with hot weather around July 4, led to a large crop. The remainder of July found moderate temperatures allowing for slow and even ripening. Harvest for still wines occurred from September 3 to September 14, making 2013 the most compact harvest on record. All vines were farmed following biodynamic principals. 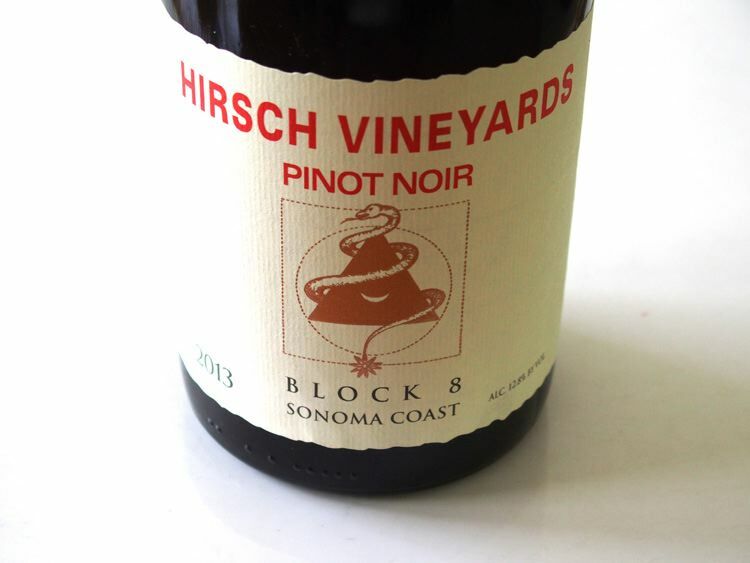 The 2013 vintage Pinot Noirs were among the most delicate wines from Hirsch Vineyards in recent memory. They are the antithesis of the highly concentrated 2012 vintage wines and may leave some consumers looking for more fruit. 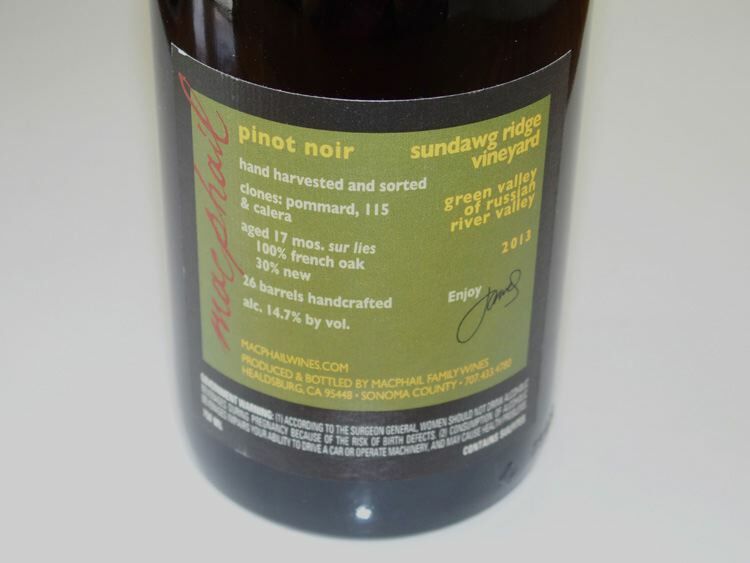 A very limited amount of West Ridge Estate Pinot Noir was also produced in 2013. Visit www.hirschvineyards.com. Kendall-Jackson offers both a Jackson Estate Appellation collection and a Jackson Estate vineyard designate collection, both from Jackson Family estate vineyards. The wines are produced with 100% renewable energy and both the estate vineyards and winery are certified sustainable. The wines are available at select onpremise locations as well as through the website at www.KJcom. 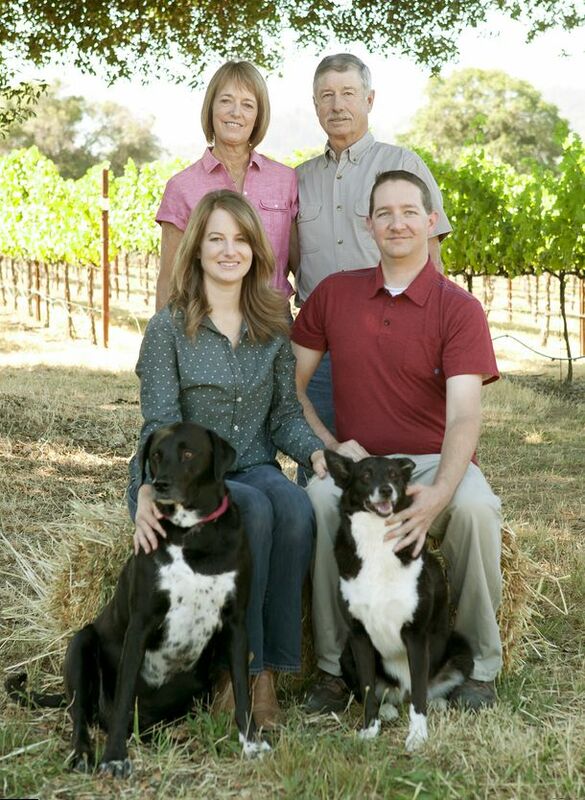 Adam and Dianna Lee produce about 10,000 cases of Pinot Noir annually. Each barrel is vinified separately by lot, clone, yeast and cooper, then blended individually and bottled unfiltered and unfined. The wines are sold directly to winery mailing list members and through distributors to select restaurants and wine retailers nationally. Tasting at the winery is by appointment daily. Visit www.siduri.com. The 2014 vintage in the Willamette Valley had a temperate spring, perfect weather at fruit set, and a warm and dry summer. Harvest was the earliest on record, beginning September 8. The wines from this vintage are concentrated and fruit-driven. 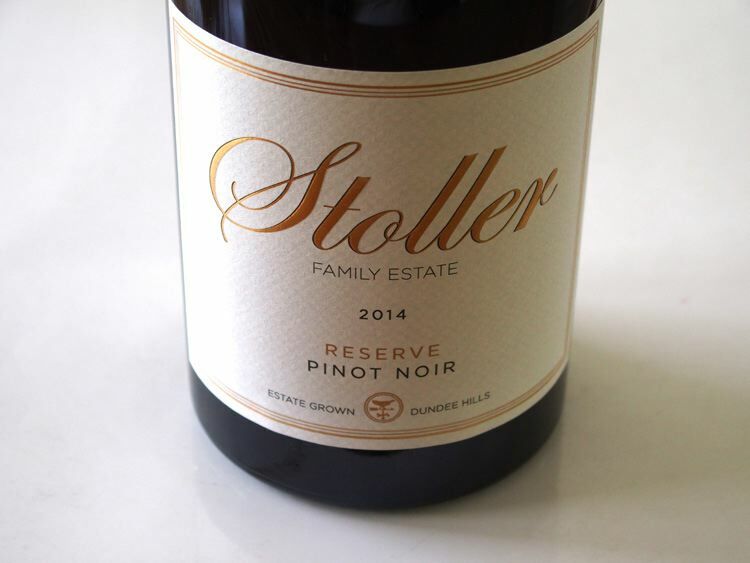 For more information on the winery, visit www.stollerfamilyestate.com. The 19th Annual Anderson Valley Pinot Noir Festival will be held May 20-22, 2016, in Anderson Valley. 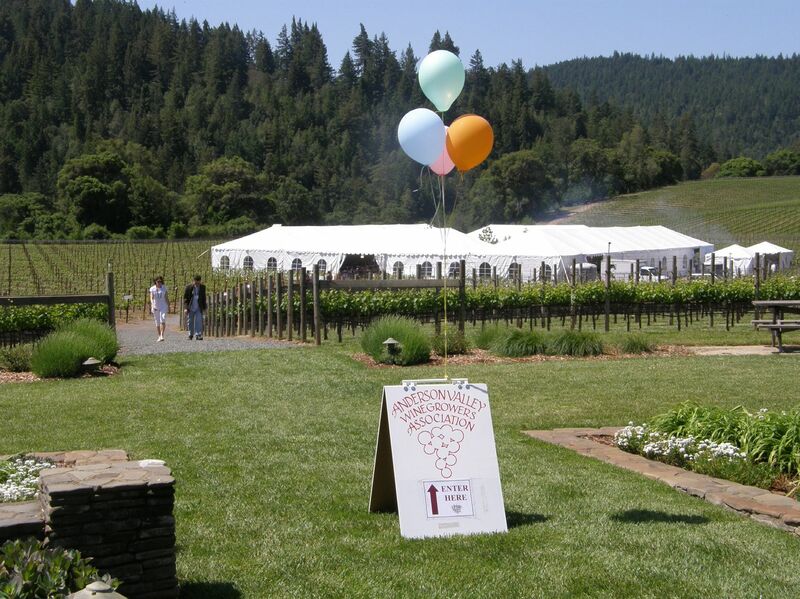 The event was first formalized into a festival in 1997, and has increased in popularity over the ensuing years in step with the rise in quality of Anderson Valley Pinot Noir. The event, sponsored by the Anderson Valley Winegrowers Association, is always sold out. I love this festival for its country flavor and the hospitality of the friendly hosting wineries. A few days in this bucolic valley with its picturesque vineyards, moss-covered oaks, old apple-drying barns, split-rail fences and welcome tranquility is guaranteed to invigorate your spirits. The Anderson Valley appellation was founded in 1983, and is located in northwestern Mendocino County, along Highway 128. As the crow flies, the valley is about 10 miles from the Pacific Ocean and about 15 miles long, opening to the Pacific Ocean by the Navarro River. At 38 degrees latitude, the climate is mostly Winkler Region 1. There are 30 bonded wineries and 32 tasting rooms. As of 2015, there were 91 vineyards owned by 71 farmers, with a total planting of 2,502 acres (99 fallow acres excluded). There are 1,736 acres of Pinot Noir, 539 acres of Chardonnay and small amounts of Gewurztraminer, Merlot, Pinot Gris and Riesling. The Anderson Valley Winegrowers Association has 55 member wineries (both in and outside Anderson Valley) and 48 member growers. 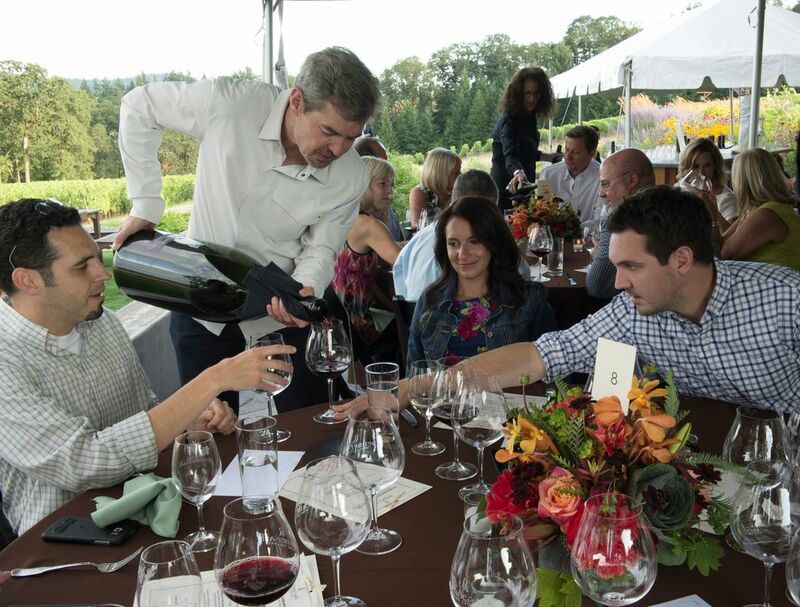 About 50 wineries will be pouring Pinot Noir in all its forms at the Festival’s Grand Tasting. Friday, May 20: Technical Conference including lunch at Mendocino County Fairgrounds, 9:30 a.m. to 5:00 p.m..
Friday evening, May 20: Casual BBQ at Pennyroyal Farm, 5:30 p.m. to 8:30 p.m.. Outdoors, bring a jacket! 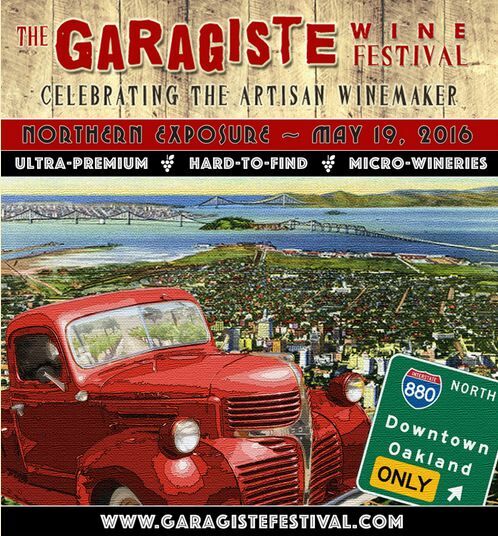 Saturday, May 21: Grand Tasting in the tent at Goldeneye Winery, 11:00 a.m. to 3:00 p.m.. Arrive early for more time with winemakers. Sunday, May 22: Visit Winery Open Houses. An opportunity to visit some wineries that are usually not open and revisit other favorites. Accommodations in the Anderson Valley are very limited (check the PinotFile Travel Directory). Other options are in the town of Mendocino, a 45 minute twisting drive through the redwoods, Cloverdale, a 60 minute drive along Highway 128, or Healdsburg, an 80 minute drive north on Highways 101 and 128. For more information and tickets, visit www.avwinescom. Each year there is a commemorative poster at the event created by nearby Cloverdale artist Gerald Reis and available for purchase. The granddaddy of all Pinot Noir festivals, the International Pinot Noir Celebration (IPNC), will hold its 30th annual event July 29-31, 2016. Master of Ceremonies James Halliday is welcoming pinotphiles and winemakers from all corners of the globe to three days of unforgettable meals, seminars, vineyard tours, and joie de vivre among fellow lovers of Pinot Noir. IPNC is the ultimate Pinot Noir Bacchanal. Although IPNC is held on a college campus (Linfield College in McMinnville), there are no early morning classes and no tests. 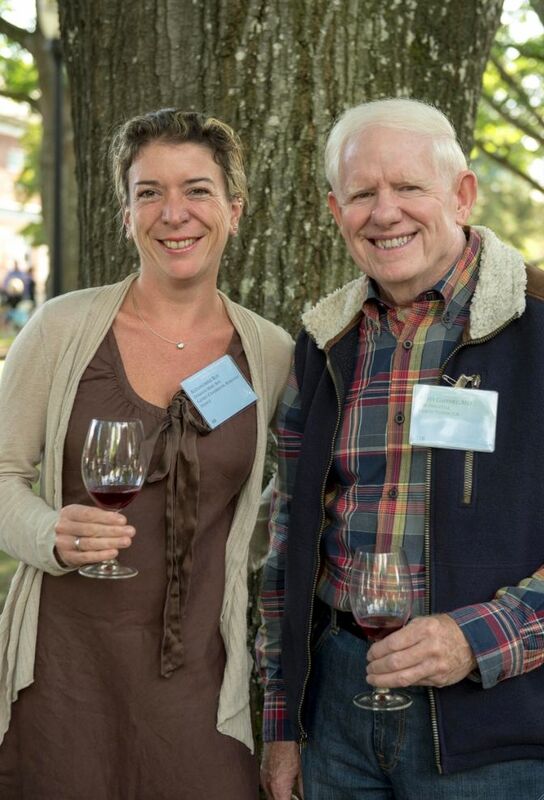 IPNC has hosted well over 200 winemakers from France, and many from Australia, New Zealand, Italy, Germany, Switzerland, Austria, Canada and South Africa, along with hundreds of Oregon and California Pinot Noir winemakers. The emphasis is always on quality (wineries are accepted to participate based on merit) and stylistic diversity, with many new winery faces appearing each year. There is no judging of wines for the event as this is a pure celebration of Pinot Noir. Oregon: Alexana Estate Vineyards & Winery, Anam Cara Cellars, Archery Summit, Ayres Vineyard, Bergstrom Wines, BrickHouse Wine Company, Brittan Vineyards, Chehalem, Colene Clemens, Cristom Vineyards, Domaine Drouhin Roserock, Domaine Serene Vineyards & Winery, Elk Cove Vineyards, Foris Vineyards Winery, Harper Voit, J. Christopher Wines, J.K. Carriere, Johan Vineyards, La Crema Winery, Lange Estate Winery, Lazy River Vineyrd, Owen Roe, Panther Creek Cellars, R. Stuart & Co., Rex Hill, Shea Wine Cellars, Sineann, Sokol Blosser, Solena Estate, St. Innocent Winery, Tendril Wine Cellars, Trisaetum, Walter Scott Wines, Winderlea Vineyard & Winery, Witness Tree Vineyard. California: Au Bon Climat, Benovia, Cuvaison, Dutton-Goldfield Winery, Failla, Flowers Vineyards & Winery, Freeman Vineyard & Winery, Lutum, Masút Vineyard & Winery, Peay Vineyards, Phillips Hill Winery, Sandhi Wines, Small Vines Wines, Spell Estate, Thomas Fogarty. North America: Blue Mountain (British Columbia), Wyncroft Marland (Michigan), Ankida Ridge (Virginia), Syncline Winery (Washington). Southern Hemisphere: Bodega Chacra (Argentina), Bindi Wines (Australia), Coldstream Hills (Australia), Craggy Range (New Zealand), Dawson James (Tasmania), Mac Forbes Winery (Australia), Peregrine (New Zealand), Stonier Wines (Australia), Tolpuddle Vineyard (Tasmania), Yabby Lake (Australia). Europe: Maison Ambrose (Burgundy), Champagne Henri Giraud (Champagne), Domaine Charles Audoin (Burgundy), Domaine Huguenot (Burgundy), Domaine Fougeray de Beauclair (Burgundy), Domaine Henri Gouges (Burgundy), Domaine Marc Roy (Burgundy) (Alexandrine Roy pictured below at a previous IPNC), Domaine Du Marquis D’Angerville (Burgundy), Philippe Pacalet (Burgundy, Domaine Vacheron Vignerons (Sancerre), Weingut Burg Ranevsburg and Weingut Heitlinger (Germany). Tickets for the full weekend ($1,195) are now 80% sold out. Act promptly if you want to attend! The Full Weekend Ticket includes 2 Grand Outdoor Tasting, numerous seminars, Friday Night Grand Dinner, Saturday Night Salmon Bake, a Vineyard Tour & Winery lunch, University of Pinot courses, small format tastings, Friday and Saturday Breakfast on the Patio, and Sunday Sparkling Brunch Finale. Sunday afternoon Passport to Pinot Tasting tickets ($125) are sold separately. All wines served at Passport have been served during the Full Weekend. Visit www.ipnc.org. This year more than 60 chefs from the Northwest region will cook for IPNC guests over the weekend. Although Pinot Noir is the star at IPNC, the food deserves equal billing. Strict vegans are challenged to determine which wines are vegan since wine labels do not always provide the information that qualifies whether the wine is vegan. Ingredient labels are mandated by the US government on food, non-alcoholic drinks and in Colorado, even marijuana. The ingredients in wine other than sulfites usually remain a mystery to the consumer. Many wines are “fined,” a process to clarify wine by removing sediment in which the winemaker may use animal-based products such as albumin (egg whites), casein (a milk protein) or isinglass (a fish byproduct). Although these animal-derived products are removed before a wine is bottled, the wine might not be considered strictly vegan. Some wines are also filtered through animal products before bottling. Current wine labeling laws do not require a listing of animal-derived products used in vinification or the admission that the wine is unfined or unfiltered. Wines that are both unfined and unfiltered before bottling, not uncommon for domestic Pinot Noir, are considered vegan. Organic or biodynamic wines may or may not be vegan. 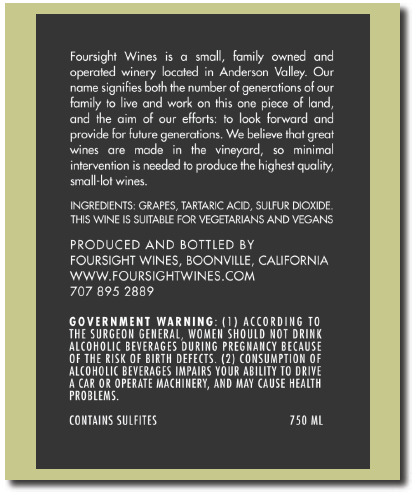 Foursight Wines in Anderson Valley was the first Anderson Valley winery to list ingredients on their wine labels, and among the first in the United States to include a statement for vegetarian and vegan wine drinkers (see label above and Pinot Noir reviews in this issue). Vegans who want to drink a particular Pinot Noir (or anyone who wants to know a wine’s ingredients) should contact the producer of the wine to see if it qualifies as vegan. 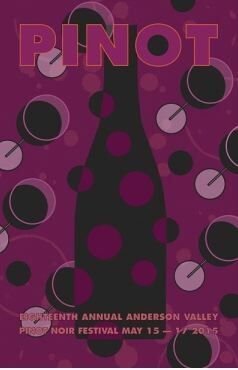 You can also visit the website, www.barnivore.com, for a listing of vegan wines among nearly 25,000 entries. For those who shop for wine at Trader Joe’s Markets, the employees at the stores can access a list of all of their vegan products, including wine.